Curious to know what can be said about Norfolk and Western operations in Ontario - what was served, what trains served it, why were they there in the first place, etc. I know the ops started with the Wabash and ended sometime in the NS era. Any info is appreciated. Why did the Wabash/N&W/NS go through Ontario? To get to Buffalo and give themselves a longer haul of freight to and from the east coast than if they'd had to just hand it over to someone else at Detroit and Toledo. 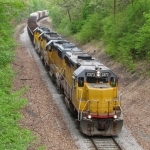 During the Wabash era, there were generally three through trains each way, daily. Since they operated via a trackage rights agreement with the CN, the Wabash didn't originate a lot of traffic. It did share a local mixed train operation between St. Thomas and Jarvis, Ontario on a six-months-CN, six-months-WAB pattern into the early 1950s. Most operations were through trains, though during the last days of the NS in SW Ontario in the early 2000s, the NS had the contract to switch the Ford Motor Co. St Thomas Assembly Plant. As I understand it, the remaining NS movements into Ontario, now, are transfer jobs to and from the CN and CP at either Niagara Falls or Fort Erie, at the east end.